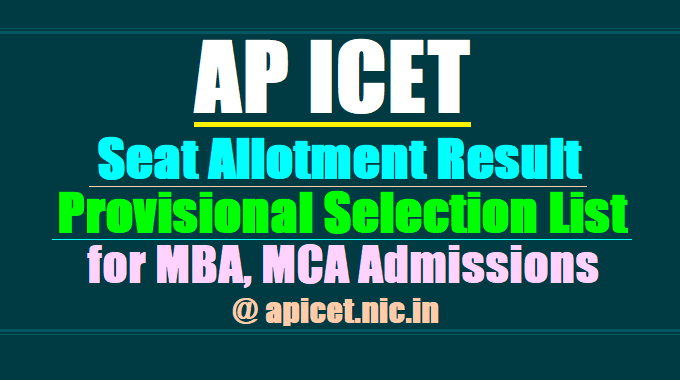 AP ICET 2019 Seat allotment result/Provisional Selection List for MBA, MCA Admissions @ apicet.nic.in/ AP ICET 2019 Seat allotment result at apicet.nic.in: AP ICET 2019 Provisional Selection List results: Sri Venkateswara University had conducted the Integrated Common Entrance Test on May ... and the result was released on May .... To get Login ID, candidates have to generate password through 'Candidate Registration' and send SMS to 8790499899 as 'APICET(space)01(space)Your HTNo'. APICET -2019 Counseling Schedule was released by President Vijaya Raju on June 28. Students' certification Verifications had been conducted from July 11th to 15th. The Web options are from July ..... The seats are allotted on .... Classes start from .... The complete details can be obtained from the APECET website on the third day of July. Nearly 54000 aspirants appeared for the counselling. To get Login ID, candidates have to generate password through ‘Candidate Registration’ and send SMS to 8790499899 as ‘APICET(space)01(space)Your HTNo’. The provisional allotment list for admissions into first year MBA and MCA courses offered in universities and professional colleges in Andhra Pradesh for 2019-2020 will be released on ......-07-2019. Candidates can check the allotment list by clicking on below given links. The list will be released on the basis of rank of the candidate in Andhra Pradesh Integrated Common Entrance Test (APICET-2019), option exercised by them (college and course selected) and their category ((SC/ST/BC/PH/NCC/CAP/Sports and games quota etc). To take admission, candidates should download the allotment order and pay the fee in one of the designated banks and obtain a receipt. They should then report at the allotted college on or before the date specified with their allotment order and fee receipt. If a candidate fails to report by the dates stipulated, the allotment stands cancelled and he will have no claim for further allotment of seats. Andhra Pradesh Integrated Common Entrance Test (APICET-2019) for the year 2019 was conducted by Sri Venkateswara University, Tirupati. ICET exam was held on behalf of the Andhra Pradesh State Council of Higher Education (APSCHE). The successful candidates will be allotted colleges on the basis of their ranks, options they exercised and whether they belong to reserved category or under the NCC/ CAP/ sports quota.